I’m a bags guy, I’m pretty meticulous about this topic. I’ve always been on the outlook for the perfect bags, sport duffles, tennis bags, backpacks… And it wasn’t any different when I began looking for a waterproof bag which should accompany through heat, cold, dry and rain on my RTW trip. 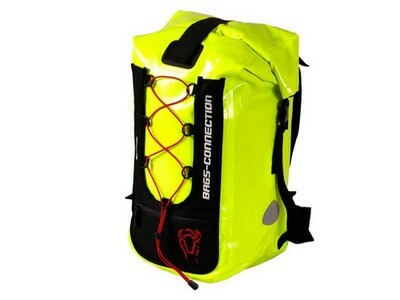 I’ve been looking for a waterproof backpack that suits my needs, which turned out to become a quest of endless online searches. It was hard enough for me to find the right non-waterproof backpack so I didn’t expect this to be any easier. During my searches I also found an article by snarkynomad and it turned out we share many of the thoughts about this topic: where’s the challenge in making a waterproof backpack that is also functional? Please read his article here. You can search amazon, ebay or google for “waterproof backpack” and there will be quite some results, but as I will show you many of them I wouldn’t entitle as being functional. They might live up to being functional in a waterproof aspect. 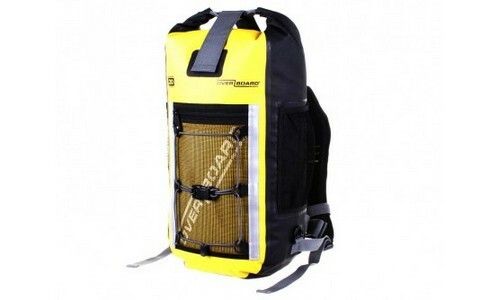 But I simply expect more from a backpack than just having a drybag roll on my back. This title should actually read “My perfect backpack” since everybody has different expectations. I chose to let it stand as is however, since I think I might speak for many technical savy hikers or motorcyclists out there. After owning many different packpacks and using them in different scenarios I’ve come to learn all the things that I like and dislike on a pack. 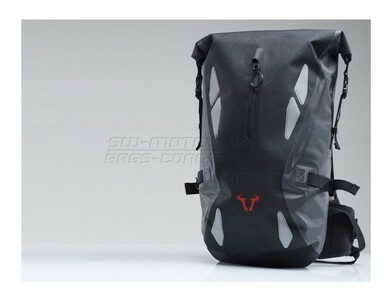 Daypack size, should be able to carry some clothing, food, drinks, camera and personal stuff like passport and wallet. So looking for something in between 25L and 35L max. For backcountry riding this would better be some sturdy materials, but I don’t really like to carry around the heavy tarpaulin made to use on trucks. I guess I’d prefer something that offers a good compromise of weight and being sturdy like a 420D nylon. I don’t like to fiddle around with raincovers and when motorcycling those can turn out not to protect the bag or it’s contents fully from the elements, the airpressure from riding down the road can “push” the water still to the bags zippers and seams. Waterproof zippers may be harder to operate and stormflaps over normal zippers have the same issues as raincovers when going fast. 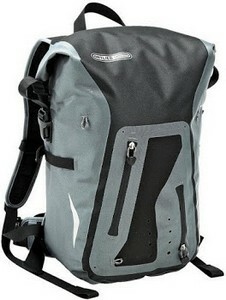 So preferrably it would have a rolltop closure which is still easy to handle and 100% rain/splashproof. While riding or hiking I like to use such. Its just easier to have a sip on the go than having to stop, taking of the helmet, cramping out a waterbottle and so on. This is an absolute must and turns out to be the killer argument for most of the waterproof packs that exist. While I don’t need loads of external pockets, hundreds of straps, loops and daisychains I do have some very simple requirements. 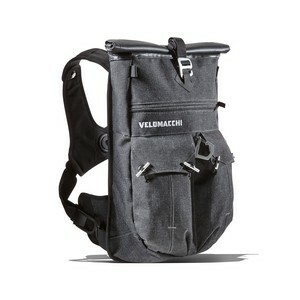 Foremost: Side mesh pockets to hold waterbottles or smaller items on the go. When doing a short hike or just strolling through a city I prefer being able to put a waterbottle or maybe a lemonade once in a while just where it belongs, in side mesh pockets! I also like to have a mesh pocket on the front, very useful to quickly drop something, a little snack, a map, etc, without having to open the bag. Alittle external zippered compartment is nice but I could live without it. Side compression straps. Even though I don’t tend to compress my backpacks that often, I like having them and think it’s just part of any functional backpack. 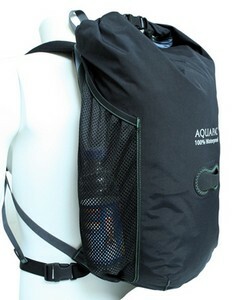 They can also be used to strap a sweater or jacket there when the bag is already full and can help to stabilize large waterbottles that stick out further from the (existing) mesh side pockets. A few loops and straps/daisychains might be useful to attach other items. On normal backpacks I prefer to have a large main comparment and then a smaller but full lenght front compartment with some organizer pockets. As on most waterproof bags only the main compartment is waterproofed I had to change my requirements a little. I would like to have some smaller pockets, but since those are supposed to hold things like my wallet, passport, keys and other small items they should be waterproof again. The simplest form is by having one or two pockets inside the main compartment. This is perfectly fine for me as it also offers increased theft protection. There should be some padding on the back which allows for air circulation as well. 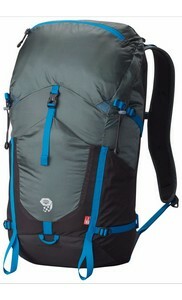 While the traditional hiking systems which have a frame might offer the best air circulation, I have never liked this. 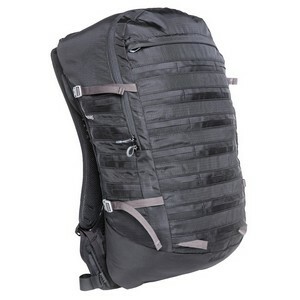 I prefer some combination of padding with mesh materials which allow some flexibility to the backpack. A sternum strap that can be shifted up and down is featured on most modern backpacks, so this is swas mething I just expect to be there. A nice addition, though not a must, is to have a whistle integrated in the clip. A hip belt is absolutely necessary to stabilize the pack when riding or hiking. Preferrably it also has a little padding and small pockets. Perfect if the waist strap can be stowed away for when you don’t need it (city trips, carry on for flights). So, now that you know my requirements and preferences I will go through some of the bags I’ve considered and tell you why most of them aren’t an option (for me anyway). Note that some of the bags I got to have a closer look in a store or having them ordered while others I did not put my hands on. 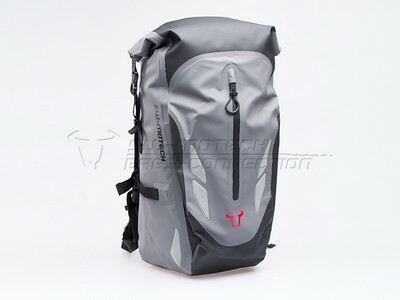 Pictures of all bags are taken from manufacturer websites or online shop sites. Note: This list is not supposed to be complete! There might have been other bags released or are already out there and I just haven’t heard of them. I started off to see what the well known german producer of waterproof products Ortlieb has to offer. I list those that are compatible with hydration systems. However I have to say that I don’t like Ortliebs implementation of this. The bladder goes inside the main compartment and theres a sealed port to lead the hose out of the bag. This has two backdraws: First if the bladder should ever start to leak, the water will just collect inside the waterproof compartment and stay there soaking your clothes or damaging your electronics. Second, to remove or insert the hose through the port I have to take off the mouth piece from the hose. This just doesn’t seem very practical to me. 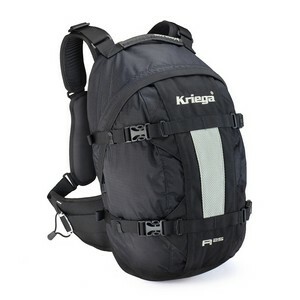 Nice sturdy quality, has an external small pocket (not waterproof). Does not have side mesh pockets. 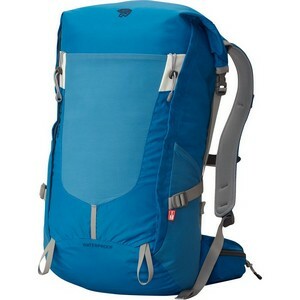 Nice looking pack, has an outside pocket that is also waterproofed with a rolltop closure, however I’ve read it’s not very easy to use when the pack is filled up. It has a frame suspension system, which, as you know, I don’t like. Looks nice, but putting a zipper in the middle of the pack that (can) split the main compartment in two seperate separtments does not appeal to me. Sturdy pack. 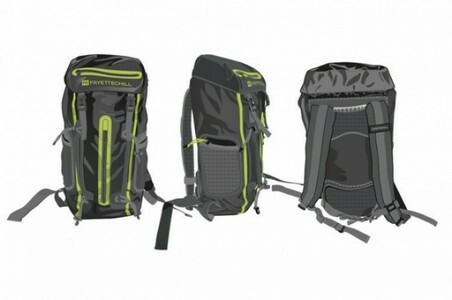 I have two waterproof rolltop bags from oversports and I like them. However this pack is not hydration system compatible. 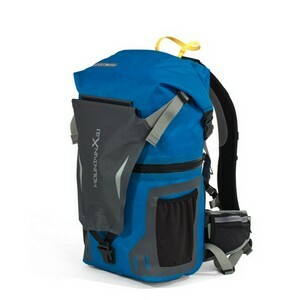 It does have a front mesh pocket (which seems quite tight) and also two mesh side pockets which are mounted higher than usual and doesn’t make sense to me since it puts the load of water bottles up to high. 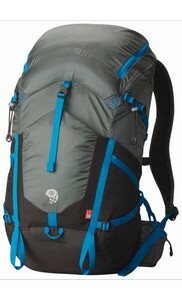 Sturdy but very basic pack, no hydration system integration. It does have side mesh pockets though. 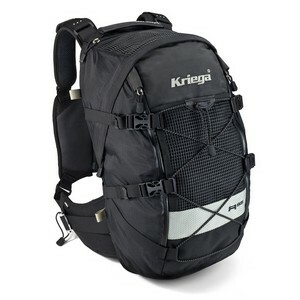 The Kriega Riderpacks are available in different sizes. R35, R30, R25, R20 and R15. While only the R30 features a fully waterproof rolltop, neither of them has mesh side pockets for bottles and utilities and they all feature a single or double buckle harness system, which I am not a big fan of because it would interfere with the ventilation on my vest. Also, neither of them is hydration compatible. They have different waterproof packs, all seem very basic to me, some have external pockets, bungee cords, but no mesh side pockets on any of them. Forget about hydration other than jumping in a river with them and drink from the river directly. 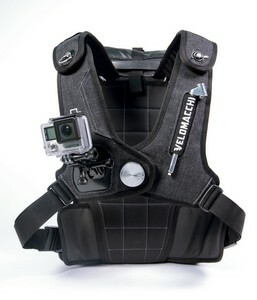 An interesting option with hydration compatibility and quite some external features. Up to this point it seemed the best option to fulfill my needs so I ordered one to have a look. It doesnt’t have mesh side pockets but some zippered side pockets which turn out to be a disappointment. They are not two way zippered, so sticking a bottle in there means the pocket stays open and the bottle has no support to be kept in place (unless it’s a very small bottle that allows the zip to be closed). Maybe one could use the compression strap to fix the bottle? Wrong, the strap is actually attached to the flap of the pocket instead of the main pack itself. So making this strap of any use is only when the pocket is closed. It also could put some stress on the zipper over time. I do like the front mesh pocket, there’s also a bungee cord. To tighten or loosen the bungee cord you need to go into the zippered front mesh pocket. It has two small outside zippered pockets versus the top of the bag, those are not waterproof but useful for little things like change etc. The rolltop closure is nice though the opening is too small in my opinion. 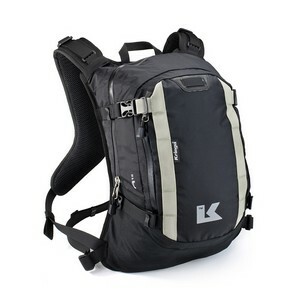 The bag as an all around zipper to extend capacity from 28L to 35L. Formely I liked the idea of a zippered extension, but I’ve come to change my mind. It’s unneccesary extra weight which you don’t need when you can just compress the bag with the side straps. As for capacity, it feels smaller than what it’s supposed to be. Where I can comfortably stuff two large fleece blankets inside of a 26L backpack from Mountain Hardware, I need to stuff them a lot more to fit in those 28L. As far as internal organization goes, it has a removable padded sleeve to hold laptop, tablet, mobile, and other gimmicks. While at first thought it seems like a nice idea it’s rather unpractical for me. The attachment of the sleeve is not very handy (you can’t see much as well since the bag is completely black on the inside) and the sleeve uses up quite some space. I would still prefer one or two internal pockets welded to the shell. The hydration sleeve is very nice, it’s between the main compartment and the back suspension, just how I feel any hydration compatibility should be implemented in a backpack. I don’t like the suspension system too much, it feels kinda bulky and doesn’t give any flex to the pack, also the shoulder straps feel somehow stiff to me. To sum it up: the bag seemed like to offer almost everything I was looking for with an extensive list of features. However it’s the implementation of the most important features that make this pack a disappointment for me. Being priced between 160-190€ doesn’t make it any better. 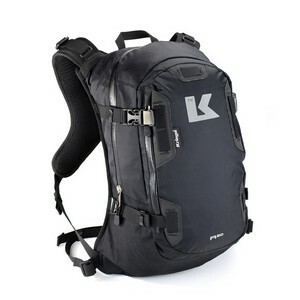 While the Kezar from Boreas Gear is neither a waterproof design, doesn’t have side mesh pockets nor is hydration compatible it is an interesting backpack. 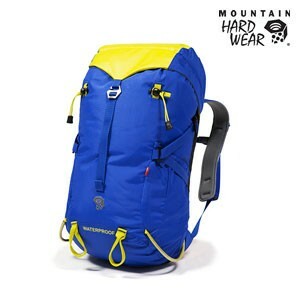 It comes with a removable suspension system that can either be used “flat” on the back or “arched” as known from many hiking backpacks to allow for more ventilation. It features tons of hidden daisy chains that would allow for attachment of gear or probably also MOLLE accessories. Thanks to some comments in snarkynomads article I learned about some more promising options. 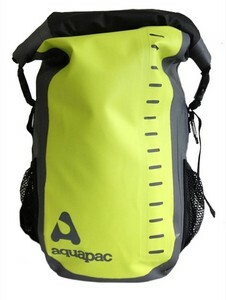 Aa goodlooking pack with external pockets (waterresistant zippers), side mesh pockets but no hydration comaptibility and no compression straps. The packs from Mountain Hardware seemed almost too good to be true, I had to immediately order some of these for closer examination. 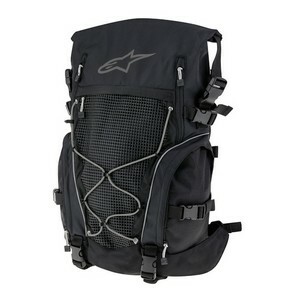 They all have excellent side mesh pockets, a great hydration sleeve between the main compartment and the back suspension, comfortable shoulder straps, sternun strap with a whistle in the clip, just the kind of back suspension padding and ventilation that I prefer, side compression straps and they are all lightweight with no unneccessary added bulk. When empty they are really flat and it’s easy to attach them on a drybag duffle or even put them inside of such one. Except the Rainshadow 26 they have small padding on the waist belt with small pockets on the outside. The waist belts can also be stowed away. I decided not to order this one for two reasons: Besides the two mesh side pockets theres no front mesh pocket or alike. Also I’m not a big fan of the traditional flip top design in daypacks. Even though it’s bigger than what I’m looking for it seemed like a very interesting backpack, so I ordered one of these. 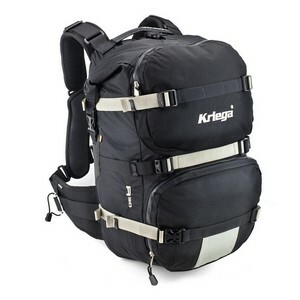 It’s made of a sturdy but still lightweight material, has a rolltop closure, a large front mesh and two very useful mesh sidepockets. There’s also some hidden daisychains along the front mesh pocket just covered by a flap. There’s only a lower pair of compression straps, I figure the straps from the rolltop double to some extent as compression straps, while you can also bleed out any air from the main comparment before rolling it up to close. Offering a “massive” 35L, it doesn’t feel that bulky. Compared to the Rainshadow 36 it feels rather compact instead. The reason being that this bag is a tad wider, hence not needing to gain volume by extending in depth. The very few things I don’t like about this bag are: No internal organization pockets and the shoulder straps seem to slip down my shoulders when not using the sternum strap. This bag is actually the one I had chosen for my trip. I will probably write a more detailed review about it. Those two bags have almost the same features and design, one being obviously 10L larger than the other, so I discuss them together. Very lightweight and not quite as sturdy material as the Scrambler. Same kind of very well designed mesh side pockets, the front mesh pocket being a little smaller on those packs. Very good compression straps, on the 36 the lower one featuring a 3-point attachment to improve distribution of compression. As said above those bags are a bit smaller in width than the 35RT. The 26 would be just the right size for me, the 35 looking too bulky when fully packed. Because it’s narrower than the Scrambler it protrudes more from your back, too much for my taste. In turn the shoulder straps spread less and I can comfortably wear them without the need to hook up the sternum strap or everyday use. Those don’t use a rolltop closure but a rather normal zipper that is protected by a storm flap. Generally I would prefer a zippered system from a practical viewpoint, however as said before, when going fast through the rain with the motorbike, water may be sucked into the bag hence not making it 100% waterproof. Albeit for hiking I think it’s perfectly protected. Big advantage of the Rainshadows: The 26 has one smaller extra pocket under the closure flap, the 36 has another one (mesh) on the backside of the main compartment. So easy to store those small items and have them protected from the monsoon. The 26 has no padding/pockets on the waist belt. In the end the 36’s only backdraw over the 26 is some added bulk when filled up, which can be countered by using the compression straps. Then the 36 has a few advantages, two inside pockets and a padded waist belt with pockets. It’s definitely a stylish bag and has some interesting features, though some of them I don’t fancy too much. I do like the outer pockets but I do miss the strechy bottle pockets on the side. Like Kriega they came up with some kind of harness connector for the shoulder straps. While it might be convenient to open and close and stabilize the pack when riding I prefer a classic shoulder strap system with sternum strap and a small hip belt. In my case I think the harness would just come in the way with my ventilation on my riding jacket. The suspension (back padding) seems ok for riding but for hikes I would wish for something more ventilated. You might wanna have a look at my friends website from ERTW, they got one and maybe they will review it sometime.